Who should serve on the next national board of directors of the Handbell Musicians of America? Whoever it is, YOU will play a vital and essential role. Who are the board of directors? The board of directors consists of a president, president-elect, and five at-large directors as the voting members. Each member serves a six-year term. The executive director is a non-voting participant. Additionally, a board-appointed secretary serves without voice or vote. The term of the current board expires September 30, 2020. At that time, P.L Grove (president), Derek Nance, and Jennifer Vangolen (at-large directors) will be replaced by a new president-elect and two new at-large directors. Those new members will join Bill Mathis, Linda Minnotte, and Kyle Webber. Jill Fedon will be our new president. Board members serve without compensation but are reimbursed for expenses directly related to their board responsibilities. In order to facilitate a national election, the national board has appointed a nominating committee. For this next election, the committee consists of Jennifer Vangolen, chair; Kathy Ebling Shaw from Area 2; and Stephanie Wiltse from Area 5. This committee’s duties are to review all nominations and then recommend to the national board individuals to be voted on by the membership. A nomination form is available at https://agehr.z2systems.com/survey.jsp?surveyId=78&. This form is the only means to nominate someone for consideration to the national board of directors. The nominating deadline is September 1, 2019. Immediately following this deadline, the nominating committee will review the forms, compare each nominee’s qualifications, and make recommendations to the board of directors. The ultimate authority for determining the slate of candidates rests with the national board of directors. This slate will contain two candidates for president-elect and four candidates for at-large director. Online voting begins February 15, 2020, and ends March 15, 2020. The membership will vote for president-elect and for two at-large candidates. The results will be posted at www.handbellmusicians.org, in Overtones, through E-Notes, and through communication with the area chairs. Who would make a desirable candidate for the national board? 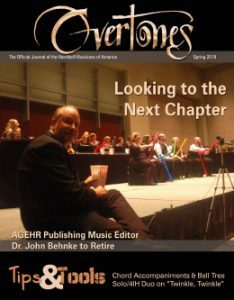 Handbell Musicians of America is dedicated to advancing the musical art of handbell/handchime ringing through education, community, and communication. The best possible future for the Handbell Musicians of America board of directors will come from good communication between diverse individuals who share our mission, vision, values and goals. YOU know these people. 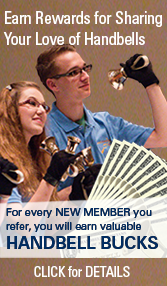 Therefore, the best possible future for Handbell Musicians of America ultimately rests with YOU. But, before you nominate someone, check with her or him to insure they are able and willing to be considered for one of the most fascinating and rewarding responsibilities they could imagine. The nominating deadline is September 1, 2019. Beginning in 2019, we are offering quarterly webinars giving members the opportunity to connect directly with national board members. Click on the dates below to register for a webinar. Ask questions, discuss goals, and offer your ideas and suggestions related to the direction and future of Handbell Musicians of America. Visit our Member Extras section of our members only site, where you will find fun activities, articles, tips, and resources. All members are welcome to enjoy these benefits, but they were designed with ringers in mind.